Hours ago, Ester Ledecká has won her second Olympic gold, in snowboarding. Today, the expectations were very different than before her Super-G shock, of course. She was defending the victory from world championships so bookmakers gave you 1.6-to-1 for her victory which means some 60% probability of her victory – much more than the 1% probability implied by the 100-to-1 odds before skiing. She may have felt some pressure that she has avoided as the "cinderella in skiing" but her confidence may be a good thing, too. Anyway, she has won both. Now she plans to add a gold in windsurfing and believe me, this is not a joke. I am excited and lots of excited texts have been written. Cutely enough, a text in The New York Times mainly discusses the same main point as my previous essay about these matters: the advantages of extreme and early specialization for the professional sports may be hugely overestimated by the coaches and the sport establishment – it may be mostly an erroneous group think. Top athletes have some general anatomic and physiological prerequisites as well as skills and moral virtues that allow them to be great. And the virtues needed for two similar sports, while inequivalent, are surely very positively correlated. So there are good reasons to think that a top athlete in one sport may be very good in another especially if the two are similar enough. Skiing and snowboarding differ in some ways but they are also closely related in others. The most recent previous double Olympic gold from two sports at the same games (winter or summer games, men or women) occurred in 1928, shortly after Heisenberg clearly articulated the uncertainty principle. Julian Schwinger was 10. One of the great things that she got was freedom – freedom to try both. Most athletes don't enjoy this kind of freedom because they're being shaped into mechanical overspecialized engines to win medals in one discipline which is considered an optimal way to exploit their lives and skills. I would add that the relationship between skiing and snowboarding may be more asymmetric than these discussions have suggested so far. Lots of her competitors in skiing said that they have tried snowboarding and the results were not good. Well, I think it's almost certainly fair to say that snowboarding is just harder and if someone manages to do snowboarding well, she or he probably has some more rare skills than the Alpine skiers. So if the Olympic snowboarders tried skiing as well, their results would probably be better than if Olympic skiers tried snowboarding. Some folks have pointed out that her path in the snow was unusual from skiers' viewpoint. It may be because she mentally analyzes the slopes as a snowboarder which is a more creative and multi-dimensional way to look at the hills. Snowboarders spend much more time on the extreme edges of the board and they probably need to make a greater number of decisions when to switch and other things. Maybe it's right to compare snowboarders' approach to that of theoretical physicists' attitude to mathematics – which is more aggressive and "out of the box" than the regular mathematicians' attitude to mathematics (well, some class of them). While skiing is more prestigious a discipline, it may be because of some inertia. Snowboarders may very well be more skillful athletes, I think. If Ledecká has found new strategies to skiing, those might be useful for others who analyze them. But it's possible that the right way to apply these strategies is so difficult that average skiers – who aren't good snowboarders as well – just won't be able to learn them. The snowboarders' superior skills have been my first topic. But I want to get to the other topic announced in the title – the question of credit, gratitude, collectivism, and individualism. As I have previously mentioned, she comes from a successful family. Her maternal grandfather Jan Klapáč was an important player in an ice-hockey team that got two Olympic medals for Czechoslovakia in the 1960s. Her father is Janek Ledecký, a top rock musician who has earned a lot of money especially in the 1990s. He's still very active and a decade ago, he composed a musical, Hamlet, that was also translated to Korean and became very successful in the Regular Korea. Before the Olympics, he was probably more famous in Korea than his daughter. The parents didn't send the kids, Ester and Mr Jonáš, to schools. Instead, they were supporting them in things they were good at. Ester has been skiing since age of 2 and snowboarding since age of 5. Her brother has also been snowboarding but currently, he is a cartoonist and designer. For example, if you look at the photograph at the top, the snowboarding "robot" outfit was probably designed by him – and maybe both of them. (Ledecká calls herself "Robot STR" where "STR" stands for "Ester".) I saw some other things he drew and I think he's very good. He has also been a great brother when he defended his sister as an attack dog against various jerks. In total, Janek Ledecký has invested some $500,000 to his daughter's snowboarding and skiing. That's a lot of money for an average Czech person but he could of course afford it. Some two years ago, Janek Ledecký bragged, Ester became a "profitable company" and she bought a Ford Mustang for her father, too, which is not the cheapest car in the world. This interesting factoid was published somewhere and it's probably known to most journalists who write about Ledecká but they won't mention such things because they think that they could hurt Ledecká and her family – in the eyes of the jealous compatriots whom I will talk about in some detail. You could have noticed that Ledecká hasn't overexposed our Czech flag and it has rather deep reasons. She believes and her family believes – and I believe – that it's primarily her personal success, and then a success of her family and coaches, and perhaps a few others (e.g. Ms Shiffrin who lent her skis to Ledecká). Of course, because of the rules by which the world works, all Czechs tend to get some credit for her legendary triumph. So folks have congratulated me, too. Well, it's not my achievement although I am pretty sure that as someone who is on a similar frequency when it comes to these matters, I deserve much more of this shared credit than the average Czech. 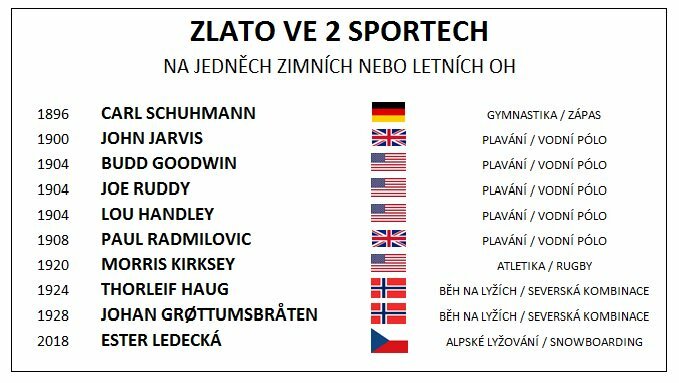 Note that she was born in Czechia and has sometimes trained in Krkonoše, the highest Czech mountains, but the main training has probably taken place in Colorado with her U.S. coach etc. The family is clearly very Cosmopolitan. Janek Ledecký: The racing season lasts for 4 months but there are at least 6 extra months of training. In total, it costs something like $150,000 [I believe he means this figure every year]. Happily, now she's a profitable company and she can earn for her expenses herself. Ester is more respected abroad than she is at home. Of course, she is happy for the support from Czech fans but she is equally grateful for the support from foreign fans, too. She doesn't have the feeling that she owes something to this republic. She has nothing to do with the republic except that she was born here, she speaks Czech, and she pays taxes here. We're in Czechia so the success is never forgiven. Amen to that. Another thing she has in common with Czechia is that she is "Robot STR" and the word "robot" was coined by Czech playwright Mr Karel Čapek. ;-) But that's it. You know, the degree of jealousy in Czechia – and indeed, the problems one may encounter just because he or she is successful – is just amazing in Czechia. I know quite something about these matters as well. During my 10 years in the U.S., when I was spending two months in Czechia in the summer, I was basically prohibited to even mention that I was in the U.S., let alone Harvard, throughout the year. A huge fraction of people are frantically jealous and many of them are even fanatically defending jealousy as the default correct attitude. Every nation has some flavor of political correctness and taboos. Somewhere, you must be afraid to mention that there are differences in the nations' skills and IQ or the genders' skills and interests, among other things. In Czechia, the success of someone in the room is a taboo – it is sometimes as politically incorrect as e.g. the N-word in the U.S. It's not hard to think of some Czech people who could only become famous outside the Czech pond. but the stories about some emigrants don't fully capture what the people who mostly stay in Czechia have to routinely face. Just like in other sports, even in skiing, there exists a fraction of "ambitious fathers" who spend all of their time with it and who try to fight for special advantages for their children during meetings of the Sport Unions and when the funds are allocated. We have never been like that and they always mocked us for getting nothing. In spite of that, I am not sorry of a single thing I did. Yup. The efforts to get some "protection" and special advantages is also unbelievably widespread in Czechia – it's basically the default attitude taken by many fathers (I could discuss some examples of fathers whom I know extremely well but it would get too sensitive). Maybe the parents of kids who are successful after such behind-the-scenes bureaucratic victories should be grateful to the Sport Unions, to the country, or to the nation. But the Ledecký family doesn't belong to this set. They haven't gotten a penny and their achievements are results of their work. I am still amazed by the rant on the Czech Public Radio's pages which was published days before her first gold and whose title is approximately I don't care about you, Ester Ledecká tells everybody. A sports reporter Mr Miroslav Bureš basically dismisses her as an arrogant girl who has achieved nothing and doesn't spend enough time by nicely talking to the journalists and representatives of the fans who are clearly, according to Mr Bureš, the main people in sports. Sorry, they're not. I can enumerate a dozen of reasons why it's a good idea to do exactly what she did before both medals – to confine herself in a bubble that is isolated from the journalists and others. The most important fact is that the sport itself should simply be more important than some P.R. and everyone who is trying to change the ordering is doing a great disservice to sports (yes, this sentence was ready to be used because I've said the same thing about science – which I care about more than sports – many times). Also, it's better for the concentration. But it's also good if you don't want to catch a viral infection. She has hinted at that explanation and it's totally true and important, too. Nobody knows Mr Miroslav Bureš but similar arrogance by such nobodies is quite characteristic. So nobody knows Mr Bureš but everyone knows people who are just like Mr Bureš (well, the most famous Bureš, a communist police codename, is our acting prime minister now but I am mostly talking about less visible people now, e.g. the prime minister Bureš's typical voters, 1.5 million jealous pieces of šit). The Czech Public Radio is partly funded from mandatory fees – everyone who owns a radio (gadget) has to pay some $20 a year. It's not much but no other radio stations are getting it. After the fall of communism, I was mostly listening to the public radio stations but times have changed. The public radio has almost disappeared from my life, except for the fees – I prefer commercial radio stations, and usually with a higher fraction of music, these days. But this unimportant journalist simply thinks that he should be in charge, that even top athletes should behave according to his wishes and prescriptions. It's insane e.g. because he may be earning the average Czech salary while Ledecká has transformed herself into a multi-million brand. Why should she be obliged to talk to him and similar people? Even if it were a good idea for her to talk to some journalists, why does this Mr Bureš think that he should be among those who will be honored? And concerning his comment about the fans, fans are primarily excited by what she's showing on the slopes, not by whether she "talks to them" through some intermediaries. Don't get me wrong. There are lots of Czechs who are happy in a similar way in which fans in other countries would be happy. And lots of people in the media agree with me and criticized Mr Bureš, e.g. marketing expert Filip Rožánek in the HN financial daily (like me, he wrote that there's no "entitlement of the people" to talk to Ledecká, she got her support for doing sports, not PR, and she's promoting herself more effectively herself than through cliché-filled interviews with average journalists, anyway, including her Facebook and Instagram strong presence). Ledecká's achievement is something that people are naturally excited by even if the superhero is a foreign person – and lots of Czechs could appreciate such foreign achievements, too. But the existence of such people who are just honestly excited about some cool success of somebody else shouldn't mislead you about the prevalent atmosphere in the Czech society and it is indeed the atmosphere of extreme jealousy. Ledecka: Hold my beer ... and snowboard. I want to imagine that the jealousy is unavoidably accompanying some Czech traits that are mostly positive such as the immunity towards hype – that is apparent even in this joke by her own Twitter assistant. Aside from the people whose behavior is adequate, you always find some amazingly annoying people who are jealous and who only tolerate success of other Czechs when losers like themselves are constantly getting credit for it. There are lots of ordinary environments where this attitude is completely dominating. My attitude may win on the Internet but the jealous and entitled view dominates the living rooms and/or the street. Even some athletes who have done cool things, e.g. in the NHL, return to Czechia and face this harassment. Also, when typical Czech women (say 60 years old) discuss the music contests or talk shows that aired on TV last night, they attack everybody who was too good or too different or too successful because it immediately means that he or she was pompous. You need to be an average piece of šit to do OK with these people. A rally is planned at the Old Town Square on Monday to welcome our double Olympic champion and she says to be "looking forward to the Czech food", maybe to mask that her truly beloved eating place is the KFC. Things may look fine but I do think that she wants to spend more time abroad in coming years because she will avoid tons of the negative attention in this way. Czechs usually can't act as a coherent nation that supports itself. In recent decades, sports count as an exception. But I feel that only collective sports and sports that are "apparently done by some unions" get this truly positive treatment from the masses of the most ordinary Czechs. Ice-hockey is a collective sport so it has always been OK for the jealous Czech. Soccer used to be OK when everyone had about the same salary but it's become a slight problem when soccer superstars emerged (the most expensive soccer player in FC Viktoria Pilsen should be sold for $17 million soon). Tennis – in which Czechs have been successful – is already problematic. Ivan Lendl and Martina Navrátilová emigrated for some good reasons, including the way how they were treated. Alpine skiing and snowboarding are arguably even more individualist sports. They're also the typical sports of the same capitalist countries that can export lots of chocolate. These sports have too much of the individualist flavor. Ester Ledecká has been hard-working for 20 out of 22 years in her life so far. But it was still done within a lifestyle that may be considered luxurious by the average Czech and that's a source of psychological problems for the average Czech. I am honored by the coincidence of belonging to the same nation as she does but please don't assume that her double triumph should be understood as a triumph of the bulk of the Czech nation or its social and political structures. She has succeeded not because of these things but despite these things. P.S. 1: Concerning these political attitudes of the family, Janek Ledecký calls himself a Euroskeptic. In fact, he claims that he was already one during the 2004 Czentry referendum. That's impressive if he voted like Klaus. At that time, I was still a "Join" voter. The current minister of defense K.Š. – almost everyone is OK with the fact that the boss of all the soldiers is lesbian – says that she's happy that Ledecká represents @ASCDukla, a military club. Wow, that's really ludicrous. Thankfully, someone before me responded that she primarily represents the efforts, investments, love, and background made by her family. What's so hard about it? I would add that to be registered with a club is probably some bureaucratic restriction and she had to pick someone. That doesn't mean that the someone deserves much of the credit.